After looking online I discovered that the little prize is itself inside a plastic capsule inside the candy egg. If the primarly concern is a choking hazzard then just make the plastic capsule easier to swallow... you just have to wait a little bit longer for your prize is all! Best laugh I've had in a while, thanks, Bill. omg These are the best things on earth!!!!!!! I remember having them as a young kid and have wondered why I cant find them anywhere. Psh now it makes sense. god America is such a freaking drama queen when it comes to ridiculous and petty things. STOP wasting you energy about these amazing eggs and put more work in to more important stuff, my god. bring the Kinder Egg to America!!! omg! its a choking hazard!! waaaaa, oh boo-freaking-hoo. That is a LAME excuse. only about 7 kids have died choking on the toy. OOOOOO hears an idea, if you realy must. Put a freaking age limit on them! like they have for beer and tobacco (oh hey look that crap kills more than the Kinder Egg and its still for sale in America! hypocrites) make it illegal for some one under lets say 14 (hey we are smart enuf by then right?) to purchase or have the egg in their possession. No where in the article did it say anything about the toy being a choking hazard, it said "non-nutritive object embedded in it." this is part of Codex Alimentarius, if you don't know it you better learn it! They are going to tell us what we can and can't eat, that we can't grow a garden, and that vitamins are bad for us. You can thank Michelle Obama for pushing the agenda.Wake up people, I just seen a video of good Samaritans in the park feeding hungry children and the needy, all the sudden like 50 cops swarm in take the plates out of the hands of 2 children and arrest the people serving the food, this was in Orlando, Fl. We pay these people for this, the only thing they are serving and protecting is their handlers. We are meant to be free people don't submit, film them, keep them in check let them know who puts food on their table, don't vote for pay raises for them, don't vote to hire 30 more in a retirement community like where I live, get them out of schools and away from our kids. If you notice you don't see many older wiser cops these days, they are hiring them straight out of high school, beware the police state has arrived! A lot of the comments here seem to be complaining about the actions of the customs officials. Should the focus here not be to try changing the law rather than blaming the people trying to enforce it? just my 2 cents. What is wrong with our country! Come on... USA is comedy central to a lot of out side country's and this tops it off for me! LOL! I grew up on Kinder, long live kinder eggs hahahaha! – It’s a behavior that I call the “Nanny State.” It’s where the government enacts laws to protect you from yourself by turning common sense into a dumb law. Most of these laws are just feel-good laws that don’t really help anyone, and just distract cops from more serious crimes. Let parents be parents! I have to wonder if the people that banned these have ever opened one. We purchased 16 eggs for our three children (ages 16, 13, and 11years) in Canada last week at the duty free shop. We promptly had them confiscated at the U.S. border, now I wonder why they needed my license plate number. The whole experience was awful mostly because you try to teach your kids to respect the law but we all know this rule is silly. The toy is not imbedded in the chocolate it is inside a rather big yellow capsule. The instructions that come with the toys have the universal not for 0 to 3yrs symbol. Are they insinuating we are not as smart as other countries and can't figure out not to swallow the capsule. Sorry for the rant but still a bit irritated they wouldn't even let us open one he just threw them all in the trash, a real downer. By the way the lady at the shop did not say anything about them being contraband nor was there a sign. Does anyone know who to contact about this ruling? Christine: I feel with you. I'll go down to the store and buy a 3-pack now. At least, I guess you can have Kinder Maxi, which is just the chocolate without the toy. It's quite good. Thank you, Big Brother. I'm embarrassed to be an American. I am so freaking mad!!! I LOVE these, and I grew up eating them and I managed not to choke on them!! People are so stupid! Kinder Eggs are illegal in America. Guns are legal. It's funny how "non-nutritional" items like children's toys are banned from US import but it is okay for major processed food brands to pump their products full of wood pulp (which contains no nutritional value). Why aren't McDonalds happy meals banned then? 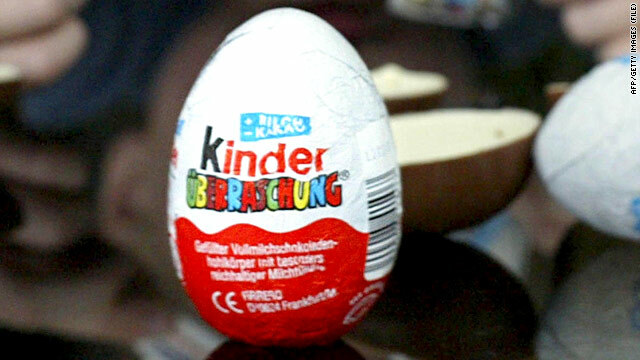 There is actually talk in parts of Europe to ban mixing "food" and toys (as this is advertising targeted directly at children) which unfortunately would mean the end if Kinder Eggs as well.